Uniden SX327 22-Channel FRS/GMRS Two-Way Radio Set - 32-Mile Range - 2-Pack | BUDK.com - Knives & Swords At The Lowest Prices! "Communication is key" - it's an old cliché, but it still rings true, especially during natural disasters, power outages, total grid failure and other emergencies. 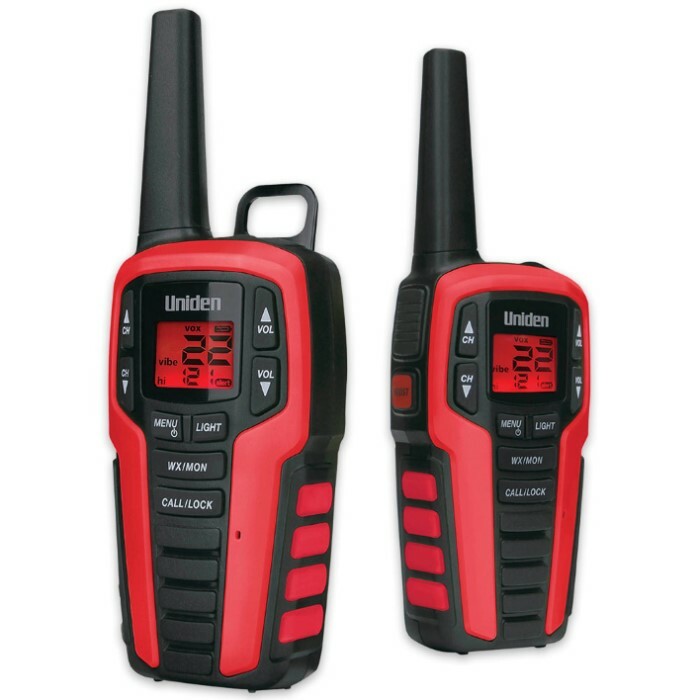 With Uniden's SX327 Two-Way Radio Set (includes two radios), severed phone lines, downed power lines, damaged cellular towers and other communication catastrophes won't stop you from staying in touch with loved ones or reaching out for assistance during crises. And they're not just great for emergencies - using these powerful GMRS/FRS radios in place of your mobile phone will save you minutes, data and, best of all, money! Take them with you camping, shopping, biking, car caravanning or other activities with friends and/or family. Rated at an impressive 32-mile range, SX327 radios help you stay in touch with loved ones via free airwaves - not expensive cellular services. No license is required to use FRS channels (7-14) - just power on the radios, tune in to an FRS channel and start talking! It couldn't be easier! SX327 radios feature 22 total channels, so there's always unused airwaves available for uninterrupted communications. These channels operate on industry-standard frequencies, so you can seamlessly communicate with people using other radio models or brands. Tune in to the SX327's NOAA weather channels and stay on top of the latest weather conditions and forecasts, even if your cable, Internet or power is down. The included charging cradle and micro USB charging cable lets you charge the radios between uses via any standard USB source - mobile phone charger, tablet charger, laptop, PC and more. 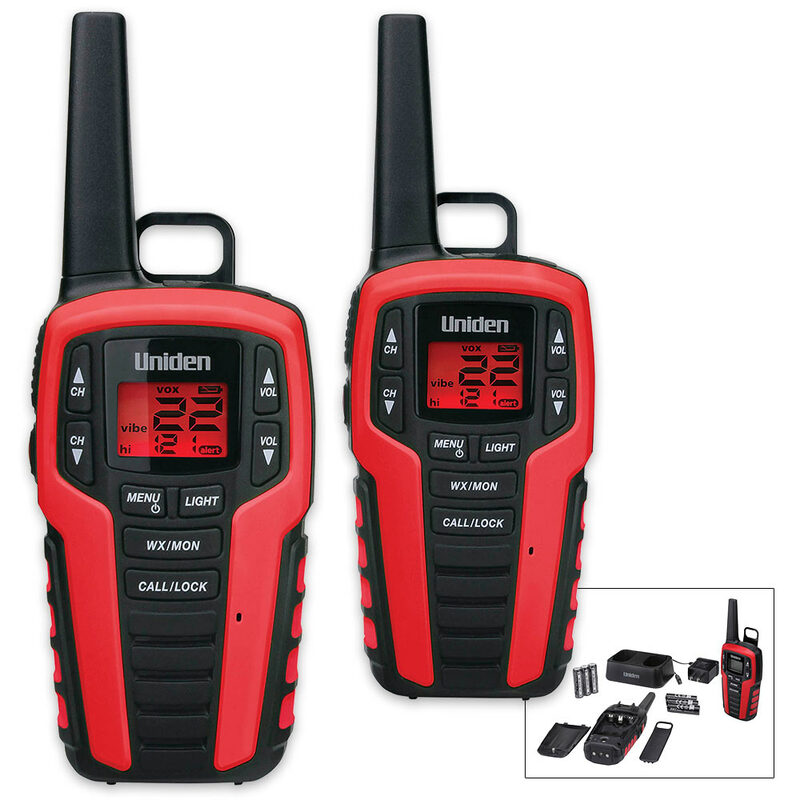 From pleasant family outings to serious emergencies, Uniden's SX327 Two-Way Radio Set is must-have communication tool! Don't live your life in silence. Order a pair of SX327 radios today! MANUFACTURER'S NOTE: Rated at up to 32 miles, these two-way radios yield the best range when there is a clear view between the radios. Uniden tests these radios from mountain peak to valley to ensure that they can meet the stated range. The curvature of the earth, hills, buildings, trees and other obstructions will typically limit your actual range.